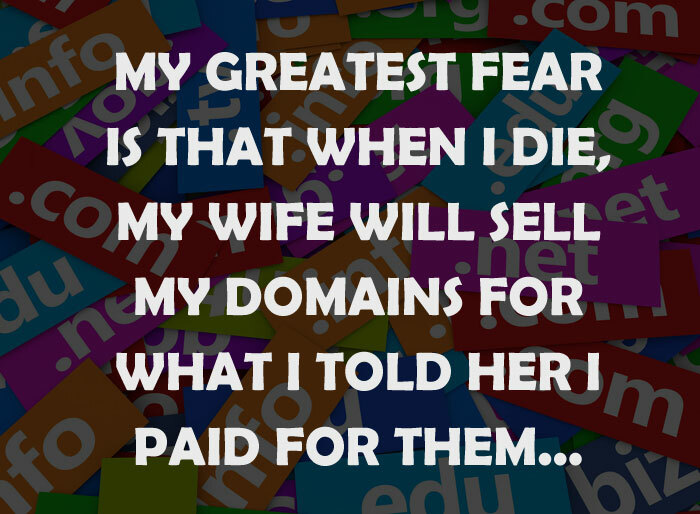 How many domainers could relate to this?! In all seriousness though, it is something to consider. If you’ve invested tens of thousands of dollars into domain names like I have, how is your other half (wife, husband, whatever else) going to know how to best use or sell them? This week we received news of yet another six figure sale for a finance related domain name. 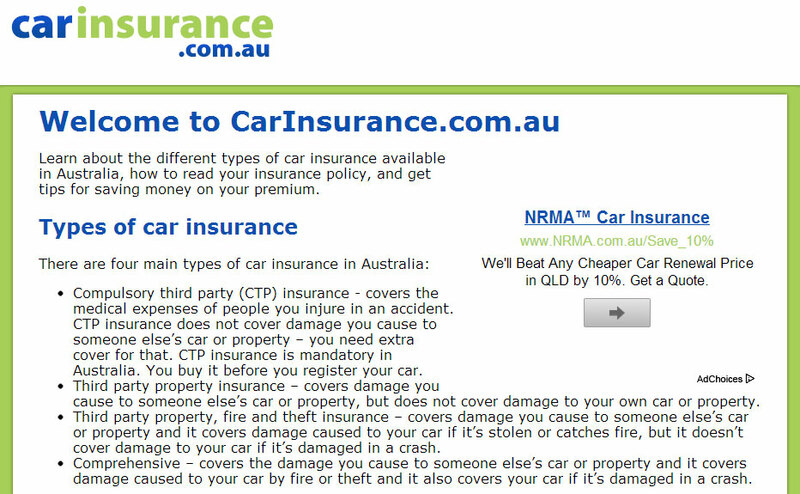 The domain in question is carloan.com.au, and whilst it may not be insurance related, it’s still worth looking at. James Wester brokered the sale of the domain on behalf of previous owner OMG, which is a wholly owned subsiduary of Fairfax Media. The buyer was CarSales.com Limited, the owner of Australia’s leading online car sales portal of the same name. Whilst the parties would not reveal the exact price, Wester advised that it was in excess of $200,000. 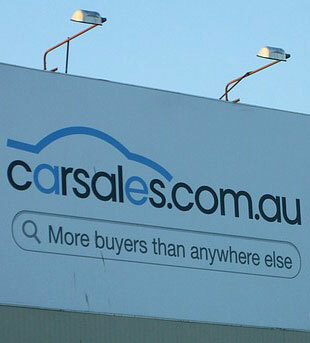 This would make it the largest domain name sale in Australia for 2013. Seeing CarSales as the buyer was certainly not a surprise to many people in the online marketing industry, as they have been prolific buyers of automotive related domain names over the last few years. This sale certainly shows the value in generic finance domain names, and it will be interesting to see if CarSales simply parks the domain (excuse the pun) or builds it into a new car loan service. Whilst many insurance companies and brokerages market themselves online under their own brand name, many choose to build websites under generic names also. There are numerous reasons for this, but generally these companies are looking to build satellite websites that target particular niches, with the idea that they will funnel prospects or leads back to their main website. What do I mean by a generic name? Generally they are based around a product or a service, as opposed to a brand name. 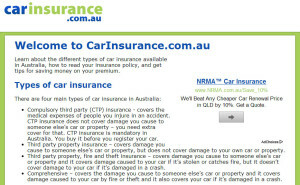 Examples could include ‘carinsurance.com.au’ or ‘insurancebroker.com.au’ etc. There’s no question that this strategy that has worked well for some people, but if you think that getting your hands on such a domain name will be easy, think again! We’ve used sales data from Netfleet, one of Australia’s largest domain name markets, to show just how much you’d need to spend to get yourself a premium generic insurance domain name. Do these domain names represent a waste of money, or a fantastic opportunity? It really depends on what you do with them. Who owns the big insurance domains? Regular readers will know how valuable generic domain names can be in the insurance sector. Super premium domains in the finance sector have sold for six figures in the past, and we decided to have a look at who owns the super premium insurance domains and what they’re doing with them. For each domain we have used the whois records to reveal the owner and have also looked at how the domain is being utilised. We’ve also provided valuations on each domain name with assistance from some of the experts at DNtrade. The valuations are based on the domain name only, and not the associated website. 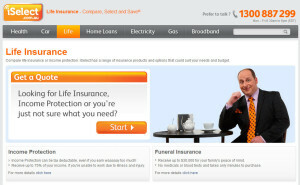 Usage: Stand-alone website which offers quotes for life insurance products and referrals for general insurance products. Comments: The most generic of all insurance domains is surprisingly not owned by one of the major insurers, and is instead owned by a financial planning company. It’s not a bad looking website, but is fairly light on information. Usage: Redirects to the life insurance page on the main iSelect website. Comments: With online life insurance being a red-hot sector, this would be one of the most sought after domain names out there. By using the domain as a redirect iSelect would not be getting an major SEO benefit, but given that they already rank number 1 in Google for ‘life insurance’ I don’t think they’ll be too concerned. Usage: A very basic one page website with no ability to request a quote or contact them. Comments: It’s almost unbelievable that such a premium domain has remained in private hands and is still so underutilised. No doubt the owner is fully aware of its value and has received countless offers over the years. 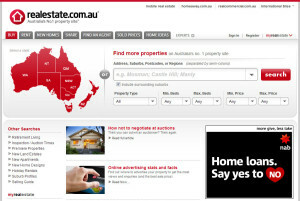 Usage: Redirects to the realestate.com.au website. Comments: It’s not a huge surprise to see this domain used by the owners of realestate.com.au, but it is surprising to see that it is very underutilised. There is an insurance section on the website, but this domain does not redirect to that area. 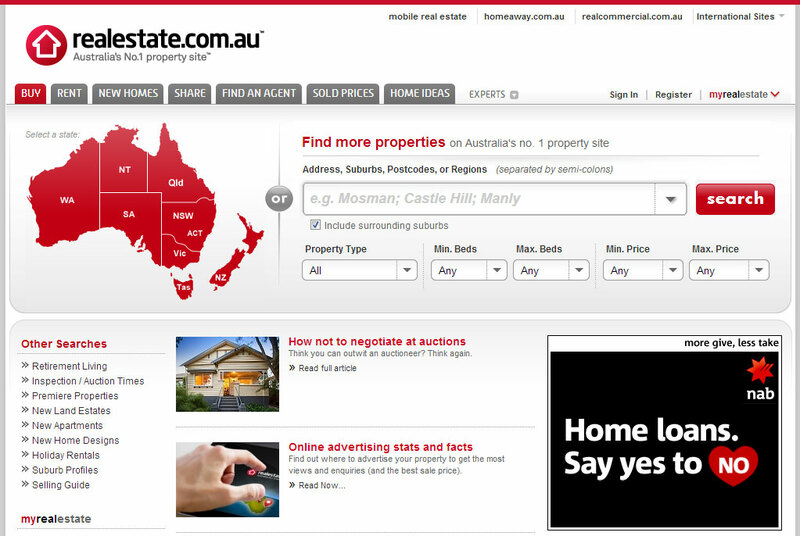 I should add that I believe ‘realestate.com.au’ is the best use of ANY premium generic domain name in Australia. Usage: Main website for the business of the same name. Comments: Out of all the premium insurance domains, this would be the best utilised. In this case an entire business has been built around the domain name, and having met the original owner who started the business around 15 years ago, it has been quite successful. 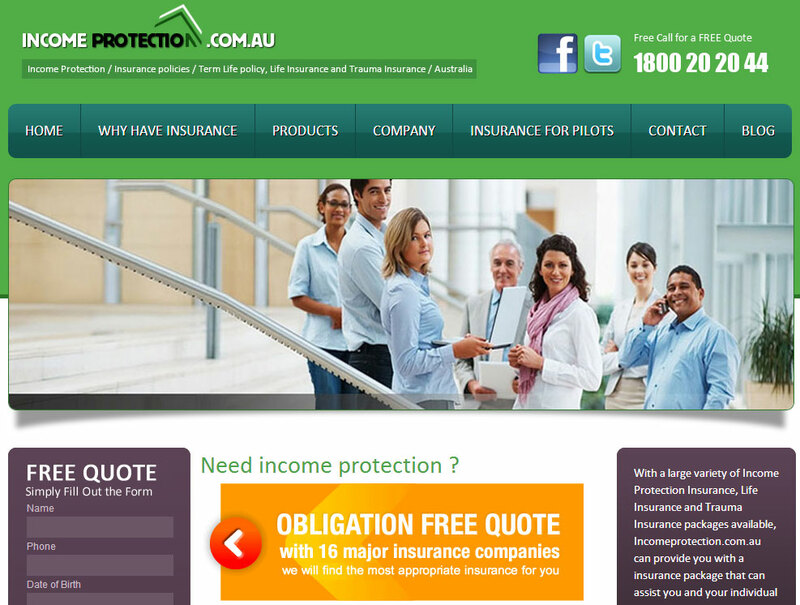 Comments: This is the second entry for iSelect, but unlike lifeinsurance.com.au which redirects to the relevant page of the iSelect website, tpdinsurance.com.au simply returns an error message. This certainly seems to be a lost oportunity, however iSelect already rank #2 for the term in Google and would probably get limited benefit from using this domain any differently. 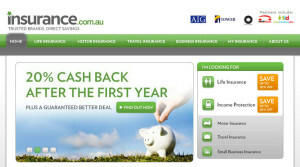 Comments: iSelect have scooped the trifecta with lifeinsurance.com.au, tpdinsurance.com.au and traumainsurance.com.au. Unfortunately this one also returns a nil result, but iSelect won’t be too upset since they also rank #1 for this term. Comments: Ordinarily a domain name with three words would no be considered as ‘super premium, but this particular domain would be one of the rare exceptions. Unsurprisingly this domain is also owned by iSelect, and as with their TPD and trauma domains it simply returns an error message when you attempt to visit the site. Usage: Travel insurance business of the same name. Comments: Finally we have a second premium domain name which is being properly utilised. 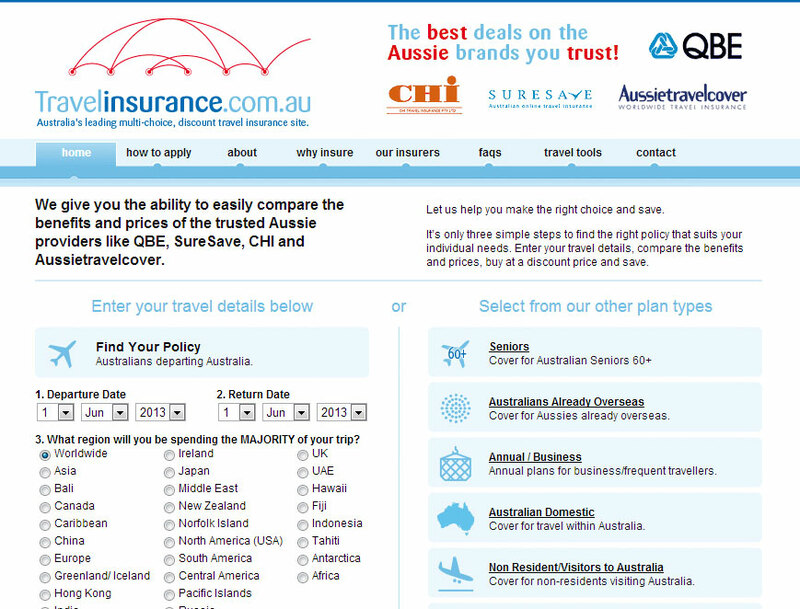 Travelinsurance.com.au is a fully branded website offering travel insurance as a fully fledged business. Unfortunately for the owners of this website it does not rank very well in Google at all, which is a little unusual for a well used premium domain. Usage: Insurance brokerage of the same name. Comments: The last domain we’ll look at is businessinsurance.com.au, and it’s pleasing to see that this is another very well utilised domain. 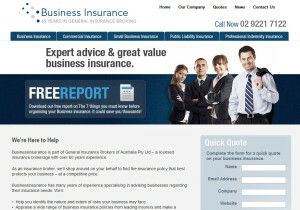 The website is owned by an AFSL holder and contains plenty of great information about business insurance and about their company. It’s interesting to see that other than those owned by iSelect and REA, many of the super premium domain names are not owned by big corporates. It’s also clear that the smaller sized owners are utilising their domains in a far better fashion than the big corporates. The reason for this may be that the big corporates can afford to buy up valuable domains and sit on them, whilst smaller businesses really need to generate a return on what will have been a fairly large investment in most cases. Going back to iSelect, they own four of the best insurance domains available, being lifeinsurance.com.au, tpdinsurance.com.au, traumainsurance.com.au and incomeprotectioninsurance.com.au. These four domains have a combined value of anywhere between $200,000 and $400,000 depending on who you ask, and potentially even up to one million dollars. But each of the domains are completely underutilised, and there is probably little need for iSelect to develop the domains since they already rank #1 or #2 in Google for each term. So why would they spend up big on buying them? One possible reason is to simply stop anyone else from getting them and doing something more substantial with the domains which could compete with iSelect’s main website. In part 2 of this article we will be asking some of the owners of these websites why they decided to invest in a premium domain name. We hope to get some interesting answers to share over the next few months. Posted on June 1, 2013 October 30, 2013 Categories Domain NamesTags domains, iselect, Websites11 Comments on Who owns the big insurance domains? The article doesn’t mention the prices paid, but we know that homeloan.com.au was purchased for $100,000+ and homeloancalculator.com.au was purchased for $33,001. Previously it was only known that homeloan.com.au sold for somewhere in excess of $100k, but given that this latest article talks about “hundreds of thousands of dollars” we can probably assume that the $100k figure was very conservative. Whilst I’d hardly call The Adviser a mainstream publication (I’m probably the only non-mortgage broker who reads it!) it is still good to see domain name sales getting attention outside of the domaining industry. I realise that these two domains have limited relevance to insurance, but with them still being in the overall finance industry it does show what a super-premium insurance domain name could potentially be worth. Every day there are hundreds of domain names which expire and are sold to the highest bidder at auction. Many of these domains are deliberately left to expire, but unfortunately for the owners, sometimes the domains have unknowingly expired. It can happen to anyone – even me! Believe it or not, this almost happened to me today. One of my content clients called me to let me know that my website (shanemoore.com.au) was down. I found this a little strange since I knew that other websites of mine on the same server were working fine, so the first thing I did was a whois search on the domain. The result shocked me, as I saw that the domain had expired four days prior! Thankfully domain owners are given around two months grace on their domains, so I was able to pay the renewal and fix the problem instantly. It happened in the same way that it happens to most other people. I had an old email address listed as the contact for the domain name, and therefore I never received the renewal notice. The easiest way to avoid this problem is to ensure that the email address listed on each of your domains is current and actively checked. It is also important to use a generic company email address rather than an individual employee’s address. Many companies have lost domains as the email address used for the domain was for a person who has since left the company. The email address is either cancelled or no longer checked, and therefore no one in the company gets the renewal, leading to the domain expiring and being lost. I couldn’t finish this article without mentioning a couple of well known examples within the domain owners community. One of the best stories is that of hardware.com.au. This fantastic domain was owned by Bunnings, however they let it expire and it was subsequently snapped up by bitter rival Masters for just over $30,000. This was an example of the email address being that of a former employee. Another great example was investmentproperty.com.au. This domain was allowed to expire by it’s previous owner, and was snapped up by an astute buyer for a massive $125,000. Losing a six figure asset due to a missed renewal is not good! Register your domains using an email address which you know will be available and monitored regardless of staff movements, and check your valuable domains from time to time to ensure that they are still active and have the correct contact details. Posted on June 6, 2012 June 6, 2012 Categories Domain NamesTags domainsLeave a comment on Don’t Lose Your Domains! Following on from last year’s post about finance related domain names, I thought I’d post a couple more large sales that have occurred so far in 2012. It seems that anything in lending market is pretty hot right now, and that is certainly confirmed in the figures below. Insurance is still as strong as ever, however there haven’t been as many high quality names coming onto the market recently. The buyer of homeloan.com.au (private equity firm, Aura Capital) would not confirm the exact price, stating only that it was in excess of $100k. 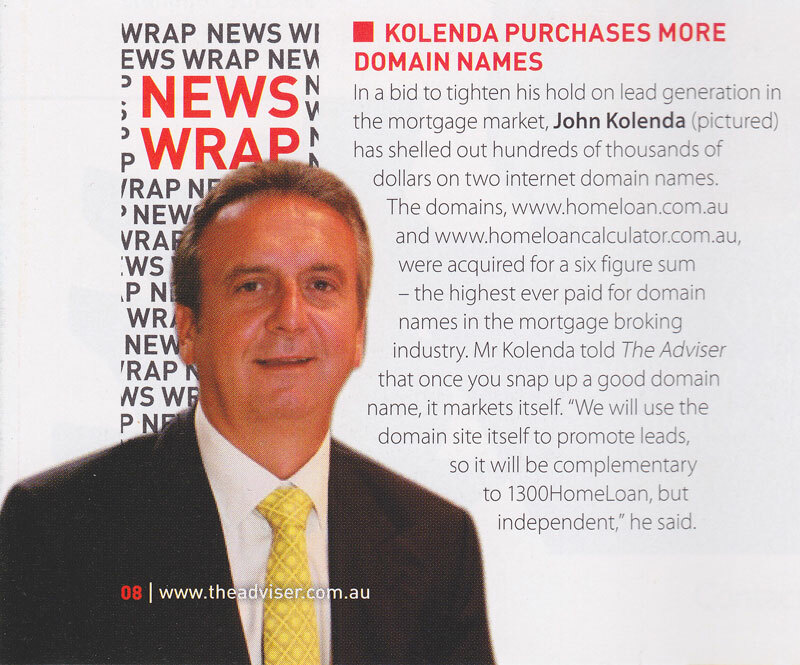 The same buyer of this domain was also behind the purchase of HomeLoanCalculator.com.au. You may think that spending over $130,000 on these two domain names would obviously mean that the buyer is in the home loan industry, but that is not the case. In an interview with SmartCompany, Aura Capital director Calvin Ng said that both purchases were purely opportunistic, and they hadn’t even determined a strategy for the domains yet. Given that information, it would certainly seem that they see the potential for strong growth in the value of finance related domain names. There is another life insurance related sale worth mentioning, however the purchase price cannot be confirmed. This sale was of a functioning website rather than a domain-only transaction. 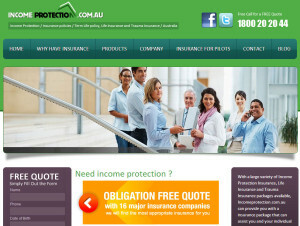 The domain name and website LifeInsuranceQuotes.com.au was listed on auction website Flippa, and although the auction ended unsold, we can see that the highest bid was $40,000. I have it on good authority that a sale was negotiated in the end, and one would have to assume that it was for more than the high bid of $40,000. There’s no doubt that prices are really getting up there, but there are still plenty of bargains to be had. In five or ten year’s time, I actually think they we’ll look back at some of the big sales listed above and think they they too were bargains. Hot on the heels of my recent post about the $125,000 sale of investmentproperty.com.au I thought I’d put together some more sales results of Australian domain names that relate to the finance industry. It may surprise some of you to learn that most of these names have NOT been purchased by insurance companies or large advice firms. Instead, many of them have been purchased by internet marketers and ‘domainers’ who develop these sites with the aim of generating leads for other financial professionals. This has proven very lucrative for some internet marketers, many of whom simply work from home with a laptop, an internet connection, and the balls to spend big on domain names knowing that the returns can be even bigger. Some of those figures are quite impressive, but keep in mind that most of the domains listed above are not premium domains. Why not? First of all many of them are the ‘.net.au’ version instead of the more commonly used ‘.com.au’ version. Industry research suggests that a .net.au version may be worth as little as 10% of the value of the more fancied .com.au version. The reason for this is simple. If you went out and marketed funeralinsurance.net.au all over the local radio and billboards, what do you think most people would type into their computer? That’s right, they’d type in funeralinsurance.com.au! 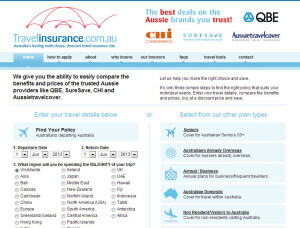 Another reason for many of the domains listed above not being premium name is due to the addition of third words, such as LifeInsuranceComparison.com.au and IncomeProtectionAustralia.net.au. Even the highest valued domain on the list isn’t quite premium, since it uses the less commonly used term HealthInsurer.com.au. If it was HealthInsurance.com.au you could probably increase the value by a factor of ten. So why are these domains so valuable? In the case of PetInsurance.com.au and CreditReport.com.au these are what are known as ‘category killer’ domains. A bit like RealEstate.com.au is the category killer in the real estate industry. For the rest of the domains, perhaps with the exception of claims.com.au, the reason for their value is due to Google’s love of domain names that match the users exact search term. For example, if a user searches Google for “life insurance comparison”, the website at LifeInsuranceComparison.com.au is going to have a huge advantage in the rankings over other websites that don’t have those words in the domain name. Furthmore, a user is more likely to click on one of the search results that contain their search term in the domain name, as they can be quite certain that that website will contain the information they are looking for. So what can advisers do about this? For starters, I recommend you start grabbing some domain names for yourself! Sure some of the names aren’t cheap, but if you picked up LifeInsuranceComparisons.com.au for $3,001, how many cases would you have to write to cover your investment? Makes sense doesn’t it…? The sales results I’ve used in this post have come from Netfleet and Drop, two Australian companies that specialise in auctioning domain names. If you have a spare moment, it may be worth your time checking out both sites and seeing what’s available. Ever since I discovered the value of ‘exact match’ domain names I have been trying to snap them up for my business. The domain name www.investmentproperty.com.au sold for a whopping $125,000 on Netfleet. Need some help? Well I can tell you that according to Google, there are 49,500 people who type the phrase “investment property” into Google Australia every month. That’s over 1,500 people every single day! Now think about the dollar figures involved in property investment, and all of a sudden $125k actually seems quite cheap. I would encourage all financial advisers and planners to snap up any exact match name they can get their hands on, as this is really the way of the future. Something like lifeinsurance.com.au is probably going to be way out of the ballpark for most firms, but keep your eye out as you never know what might pop up for a reasonable price.